President Donald Trump is pressing Democratic leaders for $5.6 billion in border-fence funding for 2019 — but Democrats face little public, media, or political pressure to end the shutdown or provide anything above $1.3 billion for some mix of fencing and various “border security” projects. Trump, House, and Senate leaders met January 2 and are expected to meet again on Friday to continue the shutdown negotiations. Democrats say they will approve $1.3 billion for border security funding, but they have not said how much or how little of that funding could be spent on an actual barrier, as opposed to additional surveillance gear or new facilities. The federal government is expected to spend $4,400 billion in the 12 months up to October 1. The $4 billion dispute over extra wall funding comprises just one penny for every $10 in federal spending during 2019. Most government agencies, including the Department of Defense, are funded. But no funds have been approved for the Departments of Justice, Transportation, State, Housing, Agriculture, and Interior. Roughly 350,000 federal workers have been sent home, and roughly 450,000 workers in those agencies remain on the job. Trump needs a win, and the Democrats desperately need to prevent him from getting a win, and in the middle are federal employees who are working for free or for not at all. At some point, the Transportation Security Administration, the border patrol, are going to have to get paid or they are not going to turn up for work. Democratic House leader Rep. Nancy Pelosi plans to quickly pass a bill on Friday that would fully fund six of the unfunded agencies until October 1, at levels already approved by the Senate. But the Pelosi package would provide only 30 days of funding for the Department of Homeland Security, without any barrier money. The Pelosi plan would minimize Trump’s ability to impose political pain on Democrats after February 30 because the only unfunded agency would be DHS. The GOP-run Senate is expected to ignore any House bill pushed by Pelosi unless it has Trump’s approval. 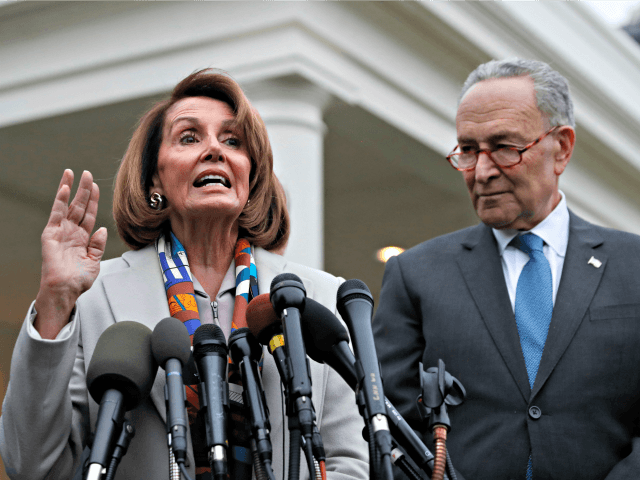 Democratic leaders rejected Trump’s argument for border security. “The crisis that they [say exists] at the border, we don’t think it exists,” House Democratic Whip Steny Hoyer said, according to the Hill.com. Democrats are blocking the budget plan — even though they now would likely approve spending roughly $1 billion on the fence — because they do not want Trump to get roughly $1.5 billion above that total. The extra $1.5 billion might help Trump claim a victory, and likely would cause Democratic activists to claim a defeat. “How many more times can we say no? Nothing for the wall,” Pelosi told MSNBC, without being asked how much she would agree to spend on construction of a fence. Democrats — like many GOP candidates in 2016 — say they favor funding for “border security.” But that vague term can include many ineffective projects, such as more lights, more trucks, or more drone surveillance aircraft.